One of the biggest challenges for tournament players is the need to employ different strategies as you progress through a tournament. Different tactics are needed in the early levels vs. bubble vs. late levels, and players must also adjust their strategy based on their relative chip stack sizes at any time during the tournament. This article will examine the changes you should make to your game when you find yourself in the enviable position of being the "Big Stack Bully" at your table. Big Stack Bully doesn't just mean you have the most chips at your table. It means your stack is so large that most of the table fears tangling with you. 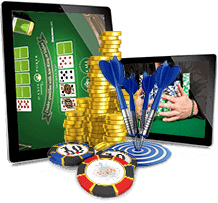 They know you can easily afford to take gambles they don't want to and can put them all-in at any time. They quiver before you, hoping that every time they put in a pre-flop raise, it'll make it past you without a re-raise. One of the first adjustments you should make is to increase your pre-flop bet sizing. If your normal open is 2.5-3 times the BB, bump this up to 4-5 times the BB. Send out a signal right away to the rest of the table that they can expect to pay dearly if they enter a pot with you. If you connect with the flop, or even if you don't but you think your opponent probably missed as well, a strong continuation bet of at least half the pot size is in order. Keep up the pressure. 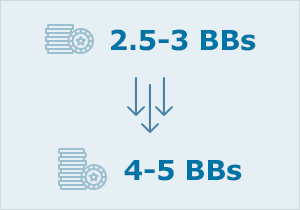 Increasing your bet size will work to your advantage in hands when you are in late position. Players who must act before you will know that if you enter the hand, you will likely raise their standard opening bet. Their play will tighten up because they don't want to throw away chips knowing you might re-raise. This will give you even more opportunities to scoop blinds and antes with pre-flop aggression. Open up your range when your effective stack size is so much bigger than most other players. You might normally be a tight player whose opening range is A-J or better, suited connectors J-10 or higher, any Broadway and pocket pairs of 9s or higher. If you've got a big stack, you can afford to play more suited aces, set mine with lower pocket pairs, and play smaller suited connectors. An advantage of expanding your range with a big stack is that the other players will notice and will assume you are playing a little wider than normal. This will increase the likelihood that you get paid when you do have a monster hand because your opponents will become less likely to lay down their solid hands against you, thinking (hoping) you are at the bottom of your expanded range or are bluffing with your big stack. A great time to increase the pressure is when the in-the-money bubble draws near. The small stacks will become deathly afraid to get knocked out so close to the money and will tighten up considerably. This provides another great opportunity to scoop up the blinds and antes and build your stack even higher. A word of caution is in order, however. If a short stack does decide to play back against you, it's likely a sign they have a monster, and you should proceed with caution. The final table is also another great time to be the Big Stack Bully because the pay jumps increase drastically with each elimination. Joe McKeehen's play in the 2015 World Series of Poker Main Event was a classic case of using a big stack effectively. He entered the final table with 63.1 million chips. Zvi Stern was in second place with 29.8 million chips, less than half McKeehen's stack. Four players had less than 13 million chips, not even one-fifth of McKeehen's total. On the second hand of the final table, when it folded to McKeehen on the button, he shoved all-in with A-4o. Not exactly the strongest hand, but considering both short stack players were seated to his left, he was not risking more than 10 percent of his stack. As it went, Patrick Chan called with K-Q and was knocked out, giving another boost to McKeehen's stack. McKeehen maintained a healthy chip lead throughout the final table and rarely received resistance when he put in a pre-flop raise. Let's say you are the table chip leader in the latter stages of a tournament, after the money bubble has burst. Another player has a stack that's 80 percent of yours while everybody else is less than 40 percent. Lots of players will say to stay away from the player with the second-highest stack because he/she is the only one at the table who can cause considerable damage to your stack. You should not avoid this player. However, what you should avoid doing against this player is trying the Big Stack Bully tactics. Don't bluff or re-raise pre-flop (unless you have a monster, of course). Don't automatically fire out a continuation bet, either. Just play your normal game against this person, and save the bullying tactics for the smaller stacks. All of these suggestions are sound strategically, but it is imperative that you continue to make smart decisions. McKeehen's play at the final table in 2015 was a great example of how to play with a big stack. He didn't go crazy, but instead continued to pick and choose his spots, using position and pressure to continually build his chip stack. He took chances a few times against players with small stacks, but he never risked more than 20 percent of his chips in any one hand, and only briefly did another player's stack size approach even half his. For tips on strategy adjustments to make when you don't have the large stack, check out the Short Stack strategy article. Play lower pocket pairs, suited connectors, suited aces. When isolated with small stacks (15% or less of your stack) don't be afraid to shove and make them decide for their tournament life, especially when you are near the in-the-money bubble or on the final table. Big stacks can be frittered away easily, so continue to make smart decisions. Don't try Big Stack Bully tactics on other big stacks.